... And how they could have made it happen. You may have read it at 3540 Jalan Sudin, how the journalists and editors* shot down Rais Yatim-Hishammuddin Hussein's attempt at giving birth to a Media Consultative Council and dealt the Information Ministry's sec-gen, Kamaruddin Siarap, a massive humiliation. None of the journalists supported the idea and said so, except for Bujai, who claimed to have gate-crashed the meeting, who thinks it is a GOOD IDEA!! Bujai did not speak up during the meeting, though, according to those who did (no, I was not there). The Council would have been a good idea if its main objective was for the government to consult the jounalists and other interested parties on which archaic Press laws should be abolished immediately and, in the longer run, which laws ought to be amended with a view of allowing greater freedom of the Press/Media. Malaysia's international ranking re media freedom is surprisingly low, given that we have one of the free-est cyberspace/internet in the whole wide world. How can we correct this misconception? The Consultative Council can help find answers. As the Council is meant to be consultative, it should be jointly chaired by the government and the media. I would suggest a former minister instead of a serving minister (who might be tempted or perceived as trying to gain control of the media through the Council). Tun Khalil Yakcob? The chairman from the media must be a respected former editor. Mazlan Nordin, PC Shivadas, Munir Majid? Everything else would have fallen into place nicely if they had the basics right. But they didn't really consult US before they called for yesterday's meeting, did they? What do you expect from a mercenary like Bujai? He is on crooked Kamaruddin Siaraf payroll. 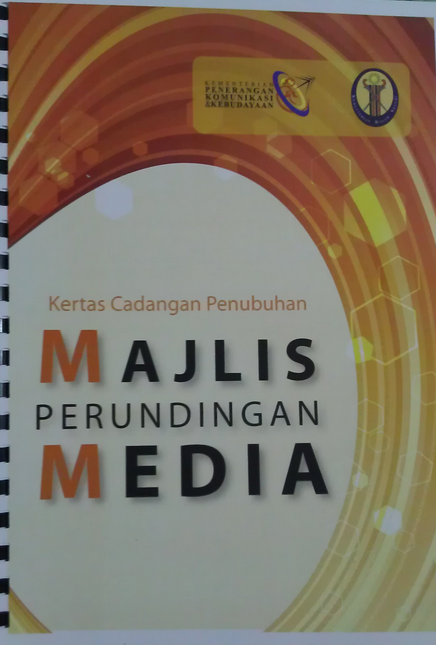 Some form of guidelines must be formulated with regards to media freedom. Freedom is often abused, for obvious reasons, therefore the rules must be formulated for balanced views. For as long as there are two loggerheads or camps, there will be champions trying to impose their message to the other side. To make matters worse, vengeance, selfishness, amateurs, professionals and idiots have instant access to the new media and they treat it like a passport to spew anything. Modern day democracy has evolved into a free for all brawl. It is reminiscent of the begining of the newsprint era. If history serves well, China went through this era thousands of years ago. Neighbouring Singapore could well be a fine example for media freedom, but, there is always that but question. Readers also are to blame for believing half truths soup,bowl and spoon. What for? More posts and more rakyat money will be spent. Consult? It has always been one way consultation from the Home Ministry to all media org and editors. Rocky why can't the chairman for this MMCC be someone more refreshing than the three you suggested? Sometime I do not understand how you think? Mo, do you even think sometime?! Pakatan takes over nanti, idea ni jadi lah. Menteri Penerangan nanti Tian Chua. Dia boleh jadi chairman council ni sekali. Alamat la Utusan NST BH tak dapat renew permit. Sekarang ni pun paper2 ni dah partially blocked di Penang n Kedah. Puak2 tu sekarang kata nak freedom of the Press, tapi bila dah berkuasa, segalanya dibuang keluar tingkap. Dasar auta tahap tak reti aku nak kata. Hypocrite bastards. Why all those nice sounding council....? Curb your freedom thats all! This so-called Media Consultative Council should be helmed and run by a Media person, period. Any gomen's involvement, evenm if it was to facilitate the formation, fund, premis and ideas would be looked upon as interference, knowing how the media and the public at large should think. Malaysian Media is matured enough to organise things by themselves for themselves and onto themselves. I should think that the person who should helm this council should also be off-media person, a former media man now no longer in the industry. He or she must be of certain qualities. I read with despair the kind of representation the gomen (read: Rais Yatim's ministry) proposes -- among whom are the JASA officers...i mean WTF is the need of these good-4-nothing guys have to do with media? They arent media ppl at all while RY play bodex with putting in some guys from PMO...shud they? The best part was to exclude the New Media...this is the killer blow...u wanna have a media council but no new media, instead some suspicious Jasa officers...then what? No online media as well? A good idea managed badly...but there is still hope, though!